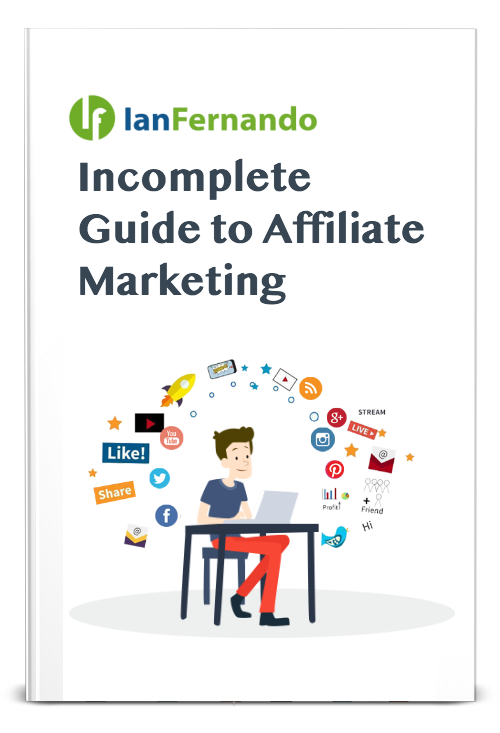 Jitendra: Hey, hi guys I’m Jitendra, I’m right here now live from Affiliate World Asia and I’m with blogger and affiliate marketer Ian Fernando. So Ian please share your journey in affiliate marketing. Ian: Well there is a lot of stuff that I can talk about, I mean from when I first started maybe 10 years ago to now having my own business, several products, several companies, doing investment… so you tell me where you want to start and we’ll go from there. Jitendra: Yeah, so how did you get started in affiliate? Who taught you about this affiliate marketing? Who are your mentors? Ian: So back in the day I got into affiliate marketing because I was kind of forced into it; I was working three jobs and I didn’t want to… my goal was technically to get rid of two jobs and basically have one and that was my goal, so I basically researched I became an eBay vendor. By that time I was still working three jobs so I was not able to get rid of the side effects of having customers and refunds so it was still hard work. So I discovered affiliate marketing, back in the day I was working with Azoogle Ads and NeverBlue and they basically help me or specifically Azoogle Ads help me to get to 1000 dollars a day, then 2000 dollars, then 5 figures on the weekend and everything, so it basically helps me a lot in that aspect. Jitendra: So, okay what kind of products do you promote right now? Any hosting products or SEO products? What kind of products you promote basically? Ian: So right now since I do have my own products, my own offerings, my own hosting platform, I have my own… I’m an advertiser now I’ve been advertising for the past three years, I have my own nutra, diet, skin, male, brain offers now and I’ve basically learned traffic on my own internal stuff. Jitendra: So how do you drive traffic to your site, to your landing page? Ian: No, more search, so I started with Google search when they first started and then I’m just a Google guy since then. I’ve dabbled in Facebook, I’ve dabbled in PPV, I’ve dabbled in mobile, but I’m very very good in Google. Jitendra: In running Google ads right? Jitendra: Okay, so do you use any kind of Facebook ads for your business? Ian: Not really I probably only use the aspect of the social branding for it, but other than that I just buy media through Google DSP or Google adwords in that way. Jitendra: So which is your favorite affiliate program, I mean, it Clickbank,Shareasale, CJ, jvzoo…? What kind of product? Ian: So again since I’ve been an advertiser for three years I haven’t ran a lot of affiliate network stuff, but I’ve worked with Clickbooth in the past they are very good, they’ve taken very good care of me in the past. As of right now I’m not sure since I do run mostly directly with advertisers in the past and I do have my own products now, so right now I can only recommend click booth since they’ve helped me in the past prior. Jitendra: So as a blogger how is your day in a day? Jitendra: How many hours you work at least? Ian: So, probably I want to say 5 to 10 hours a day it really depends, but there are days where I probably work only from 9 to 1 and that’s it. Jitendra: Okay and you take care of your health so you do gym thing and all these stuff just to keep fit? Ian: Yes, so I always have a routine, so I don’t really look at my laptop until probably in the afternoon until I really really have to, if it’s an emergency then I’ll wake up. I do have a routine I wake up, I have my breakfast, I go to the gym, I run, I meditate and then I open up my laptop. So I try to always be mentally fit, physically fit and also healthy at the same time. Jitendra: Okay any affiliate marketers you follow right now like John Chow? Ian: Yeah, So I’ve known John Chow now for a while, Shoemoney as well, Zac Johnson, I follow Lorenzo, Charles Ngo also, so these are all very very good guys and I’ve known these guys when I first started, you mentioned mentorship prior, I probably was following Jeremy and John Chow and Zac Johnson when I was just starting out as well and I basically mimicked my model and followed their footsteps and do what they’re doing now as well. Jitendra: So did you join any kind of affiliate training when you just started in your journey? Ian: Yeah, so most of my staff was self-learning and networking and asking questions. I remember going to my first networking Summit West conference and I met so many people that I was so information overload that I wanted to do every tactic. By then I focused on just one, see if it work and then do another one and then move onto the next one. So I basically tried test and trial and became successful through that, but I also had the help of my affiliate network, my affiliate network is what got me to kind of where I’m at today as well. Jitendra: So how did you build your network in this affiliate, so you went to events and you try to build good relationships on Facebook and social media how did you do this? Ian: Like growing my brand? Jitendra: So how do you approach big people in affiliate marketing? Suppose if I want to reach an affiliate guy who’s making eight figures so how should I reach him? How should I convey my message to him that I want to learn from you or I want to meet you or just like that how should I build a relationship with him? Ian: It’s in the value for me I don’t want to get paid 5000 dollars for 8 hours, because I don’t have 8 hours to give, so if you ask questions here and there and we exchange a little value then I’m happy. Jitendra: One last question how is experience at Affiliate world Asia right now? Ian: I actually enjoyed this conference Lorenzo and his team and Jordan are doing a great job at it. I’ve been a part of the forum for a long time, I’ve been to almost good majority of their meet ups from Amsterdam to Thailand 2 years ago to London, so I have seen this from a regular meet up to a conference which is amazing so they are doing a very very job at it, it’s what… when I first started this industry it’s what the industry should be still be of all affiliates and not just marketing like other summits are. Jitendra: It’s a pleasure to interview you Ian so thank you for your time and I hope you enjoy this interview. Ian: Thank you, I appreciate it thank you. Thank you again Jitendra, I enjoyed the talk. If you want to check out his version of the interview, you can check it out at BloggersIdeas.